A recent forum discussion brought up the possibility of exchanging sinker plates between models. This is often possible, with some adjustments at times being required. 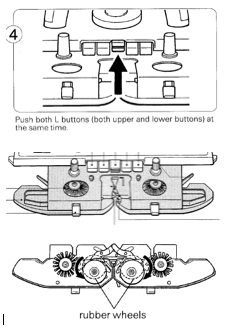 The images below show the one sinker plate I know of with truly distinct parts, made for the 892E, 894, 4.5 mm Brother punchcard models that had a thread lace capability like that seen in the bulky 260 machines. The bottom view in the first photo shows the distinct brushes and their white plastic “arms” (for lack of the technical name). The red line on the right shows the span and “nub” that may not align properly on the knit carriage if there is a huge disparity in model years. I knit using a lot of “fussy” yarns, substitute tuck wheels for the brushes usually on far right and left of image as viewed here to avoid problems sometimes caused by the bristles getting damaged and worn with use. Some people actually remove the same brushes altogether, but I have not had good results doing so. The three screws above the wheels on each side are used to adjust the space between the sinker plate and the gate pegs if needed. When the gap is too small yarn may get caught, when too great stitches may not knit off properly. Generally loosening the only the 2 side screws is enough to allow movement of the sinker plate in relationship to the gate pegs. It is helpful to have an old credit card or other “tool” to help hold the correct spacing while screws get tightened back up with carriage in its knitting position on the main bed. BTW: though some compatibility charts online list the 910 series as having thread lace capability, they indeed do not. I will try to find information on later models, and share here. Many knitters do exchange the brushes for rubber wheels. The latter are easier on yarn, and the problem of having the bristles in the brushes spread, causing snags and other issues is eliminated. I would assume the exchange would work on your 890 as well. i have a brother kh 890. i am inferring from what i read that i could change the brushes for rubber wheels to avoid castigating the yarn when knitting half the garment on hold. am i wrong?